I first heard about this book when Isla Dewar appeared at the Portobello Book Festival a couple of years ago. I was naturally intrigued to hear that it was set in Portobello in a kind of private detective agency. So I was really pleased when the publishers asked if I’d be interested in reading a copy. 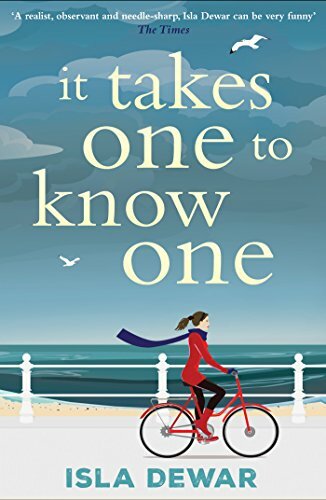 This is a gentle and very enjoyable story, with warm humour but also looks at how important ones sense of personal identity is. It is full of endearing characters, with all three of the main characters searching for something or someone, but mostly looking for themselves. The other characters – the missing or those looking for the lost – add plenty colour to the story too. I enjoyed reading about the cases Charlie and Martha worked on and finding out the reasons why people were missing. It is set in the days before the internet so Charlie and Martha have to follow paper trails, talk to people who knew the person who is missing, and they work a lot by instinct. I was very amused by their daily ritual of buying bacon rolls from one of the local cafes – anyone on our local ‘Porty People’ Facebook page will understand why! I really enjoyed the local references both to Portobello and Edinburgh and, for Portobello in particular, trying to decide exactly what shop or house Isla Dewar had in mind. I suppose this could maybe be called a cosy mystery. It had a comforting feel to the book, a gentleness and a sense of good old fashioned civility – something we could do with more of in today’s world. Having heard Isla Dewar talk at the book event I mentioned earlier, I can tell you that she is a speaker who holds her audience’s attention effortlessly. This comes across well in this book, which is a most enjoyable read from an accomplished storyteller. Charlie Gavin was abducted as a baby. He didn’t know who he was or where he came from. His mission was to find himself. And when he did, he decided to spend his life finding other lost souls by opening the Be Kindly Missing Persons Bureau. Martha Walters, his assistant, has had her fifteen minutes of almost fame and failed. Now, dealing with her guilt and pain, she lives with her mum and dotes on her young daughter. Charlie appears to be a man who is a loser and dreamer, but, hey, his office is near her house, she can lie in of a morning, take her kid to school and the work isn’t too heart-breaking. Or is it . . . ? Isla Dewar’s first book, Keeping Up with Magda, was published in 1995. Dewar found success with her second novel, Women Talking Dirty; the film of which starred Helena Bonham Carter. She contributed to the collection Scottish Girls about Town and has also written for children. Her most recent novel is A Winter Bride, set in Edinburgh in the 1950s. Born in Edinburgh, Isla lives in the East Neuk of Fife with her husband, political cartoonist Bob Dewar. I cannot wait to read this, it is on my TBR. Great review!